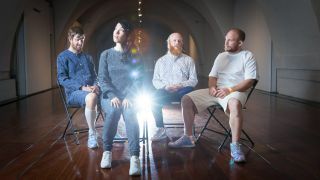 Little Dragon: "We had this idea that the sound of music has to have fire; fire was the word we identified with some kind of passion. So the dragon represents fire." Little Dragon are the epitome of a band that refuse to settle into their own skin. Having met at high school, where founding members Yukimi Nagano (vocals), Erik Bodin (drums) and Fredrik Källgren (bass) jammed to records by De La Soul and A Tribe Called Quest, the group enlisted Håkan Wirenstrand (keyboards) and began working together on original material. The band's self-titled debut, released in 2007, and notable for the beautiful ballad Twice, drew immediate plaudits. The Swedish collective have now released four albums of Neo Soul experiments, importing elements of RnB, electro pop, jazz and dance. The latest album, Nabuma Rubberband, is arguably Little Dragon's most complete. Surprisingly perhaps, the recordings were inspired by "Janet Jackson slow jams", their spirited sound lit up by Nagano's eclectic vocal and the band's communal ardour for producing cerebral electronic pop. What was your access to electronic music growing up in Sweden? Fredrik: "I remember my big brother listened to this radio show pop chart thing, and there was a lot of synth music, like Depeche Mode. But there were also these Swedish synth pop bands; although I didn't think much about making music back then." Håkan: "My brother also listened to Depeche Mode and a lot of rock: AC/DC - stuff like that. I used to sit and make models and listen to Depeche Mode. Now, when I listen to them, I get glue smells. Eventually, my friends introduced me to Jean Michel Jarre, and that inspired me. I started to dream about having a studio, because I read about Jarre's own studio with workers making all the sounds; like in a factory. I thought it was funny." The band was formed in 1996, so why did it take ten years to release anything? Fredrik: "That's not really correct. I met Erik and Yukimi in high school and played in different bands until we moved to Gothenburg and became a collective in 2003. Soon after, we started to buy computers and moved to a home studio." Håkan: "We usually played on other people's projects; then a friend, Christoffer Berg, started a label with Daniel Nordh (Off the Wall Records) in London. We were surprised they liked our songs, because we were just playing around and didn't think too much about them. So we released two songs as a single: Test and 4ever. That was in 2005, even though the songs were already two years old." The song Twice from your debut album was a standout track. Is that what got the ball rolling? Fredrik: "Not really, I think it was when we got signed to Peacefrog. They wanted to have that as a single, and we were like, 'You want to have a ballad as a single?' We didn't get it and were kind of surprised about that, but we asked a friend to make a video and it had a big impact on people, and a lot of people love that song." What did Håkan bring to the band when he joined? Håkan: "Maybe the electronics, because our drummer Erik was into hip-hop at the time, and so was Yukimi. At that point I was playing a lot of jazz." Fredrik: "You had the synthesisers. We had mixed feelings; some sounds were kind of cool, some not so cool. We came from an acoustic background and liked electric bass and Rhodes, so some synth sounds felt weird; then we started to like the fake vibe." Håkan: "My mother is a violin player, she hates fake string sounds in music, but I love the fake sound; it's kind of romantic. A lot of synth manufacturers are focused on making things sound natural, but you should explore all possibilities to make sounds." Fredrik: "And then you have the Mellotron, which is supposed to replicate strings but has a soul to it. Nabuma Rubberband is actually the first album where we hired a string quartet. Originally, we had software strings on those tracks, but it really added something different." We've read that the name Little Dragon comes from Yukimi's temper in the studio. Is that the case? Håkan: "No, it's not really right. It was in a period when our friend wanted to release our songs and we had to have a name." Fredrik: "We had this idea that the sound of music has to have fire; fire was the word we identified with some kind of passion. So the dragon represents fire; but also being Swedish, we're a little bit modest, so it's like: 'Little Dragon' [laughs]." Fredrik: "What made a difference is that we worked together more on the production and arrangements to work out the structure of the songs. Also, we let someone else mix the album." Håkan: "All the sounds came from us, but the mix engineer put everything in place in a good way, so I think it's the mix that makes it more accessible. We're still producing ourselves, but this time we had more time. We had been touring and everyone was eager to have some time for themselves, so we were kind of scattered. I was coming into the studio in the evenings and Erik was there in the daytime. I also moved to Berlin for a while. We said to each other, now that we have a bunch of ideas, let's work on them together so that everyone has to be in the same room working on the same songs." Is it true that Nabuma Rubberband was influenced by Janet Jackson ballads? Håkan: "Yeah, it's true. There are other influences too, but maybe Janet Jackson is the most concrete influence; it made Yukimi try something different." You went on the road with Gorillaz. What did you take from that experience and apply to your music? Håkan: "We were a support act for some of the shows and it felt like our music could carry out to a large audience. But it was also great to meet our own heroes, like De La Soul, and chat with them." Fredrik: "There were about 80 people on that tour: the Syrian National Orchestra, Mick Jones and Paul Simonon from The Clash, Mos Def, and even Snoop Dogg for one or two shows. There was a lot of waiting in backrooms, so I could write music on the road. I used the Native Instruments Maschine, which I could connect to my computer. I would mess around with stuff, but not think about it that much until we got home." What is your studio environment like? Do you have a dedicated studio space? Håkan: "It's a dedicated space; we actually lived there for a while. We basically have one little room each with our own studio setup, a live rehearsal room and a living room with a sofa." ego, but we prefer to work on our own." Håkan: "The vibe in the studio is kind of playful, except for my role, which is more serious [laughs]. Obviously, Yukimi has a specific role in writing the lyrics and singing. Some people think I play all the synth parts on the record, but that's definitely not true." Erik plays live drums and you two program drums. Is there ever a conflict there? Håkan: "Yeah, I tend to program drums, but Erik likes programmed beats as well. He kind of amazes me; he plays drums like it is a sound he is playing to. We try to balance it out so that it doesn't sound too clinical. We used to jam, and we should do it more because it's fun and unpretentious." "Although I don't think it's either better or worse, analogue definitely has some kind of character, just like an old double-bass has." At what point does Yukimi write the lyrics and record the vocal? Fredrik: "At the mid-point. With some songs we only have drums and bass, or maybe just an eight-bar groove or loops, and she puts down the verse. Sometimes we give her something more harmonic; then we try to make a song out of it. When she comes in with the lyrics, the song-making really starts. On this record, she was taking a bit more of the cues from us when it came to the melodies." What gear can we find in your studio? Fredrik: "We have Egg monitors [laughs]; they're really nice. Some designer worked out it is the ideal shape for a monitor, but they sound really good, actually. And Håkan has an old pair of JBL 4412 monitors. We also have a pair of MixCubes and a second pair of JBLs in the main rehearsal room for mixing. So we just move around the different rooms, depending on whose computer we're sketching the songs on." Do you have many hardware synths? Fredrik: "We like the Roland D-50 but use EQ to process the sound a bit, although the people who make presets should get more credit because they're quite an artistic creation." Håkan: "I'm quite interested in that aspect, because we don't really know how involved other artists get in making sounds, although we do try to pick sounds that are not too familiar." Fredrik: "The Yamaha TG77 really helped us. We also use the Sequential Circuits Pro 1, Waldorf Pulse, and have a Studio Electronics SE-1X. The analogue machines have more body for bass sounds; a punchy bass frequency. The digital machines with an analogue filter are more airy sounding, but when it comes to buying hardware, it's more down to whatever is cheapest [laughs] or what we can loan from a friend." You seem to have a preference for analogue sounds? Fredrik: "A lot of analogue stuff has some kind of vibe, an instant character to it. Even the digital ones with an analogue filter, like the Ensonic ESQ-1, which we use a lot, and the D-50 - they're digital but still have some old components to them, some abstract vibrations that feel alive. That's hard sometimes to find in software - it's not that common. You have to work a bit more with the software and, although I don't think it's either better or worse, analogue definitely has some kind of character, just like an old double bass has." Are you still on the lookout for hardware? Håkan: "I would also like to get a Memorymoog or an Oberheim Matrix, and I like the Yamaha CS80 and Roland Jupiter, but they're too expensive. There are too many collectors out there. I have seen the Yamaha CS80 for £10,000, so it's really not worth it, even though it's a great-sounding instrument." Is it all recorded on a Mac? Håkan: "No, actually we're still using Cubase in Windows. It's a little bit hard to get into new programs; we're used to Cubase and it works for us." Fredrik: "I use Cubase with a Mac, as it's portable. I'm happy with Cubase but have started playing with Ableton Live to do DJ mixes. If you don't have the decks, it's kind of easy to make a mix on it; also, the Warp mode is easier to understand than on Cubase." Do you have any favourite VSTs? Fredrik: "We prefer to get our sounds from hardware than use sound libraries or VSTs, but the HALion was used a bit for strings, although we did use real strings in the end. The are some synths and bass patches on the album; we tried the virtual PPG Wave synth a little bit because it was used on the Depeche Mode record, Construction Time Again. I like its metallic sound; it was when they were moving towards a more industrial sound." Do you spend a lot of time editing, and how much was the mix engineer involved in that? Håkan: "To save time, we record and edit together and try to get the sounds and sound levels right at the same time, too. We mix mostly in the box and usually work together to try and get it right, but this time we did a Skype call with Jaycen Joshua - the mix engineer. He is very professional and tried to understand what we were trying to achieve. At first, we sent all the stems, dry and wet, but there was too much, so we gave him the vocals dry and a few others with our effects on and tried to be more specific about which ones we wanted to keep and those we felt kept our characteristic sound. On Pink Cloud, we got a bit stuck, so for that one he was editing and swapping some of the sounds." Fredrik: "We have been talking about using a producer, but only if there is someone that we think feels right. It's hard when you have four in a group, because the one who screams the loudest usually gets their way, so to have a fifth independent person can make things more manageable." What role does technology play in your live setup? Fredrik: "We both play synths and samples and sample all of our sounds. When we play live we play 100% live. Håkan has a pad from which he triggers certain characteristic drum sounds, like kicks and snares, and I have the bass sounds, which are either sampled from the album or new ones from a synth. We have one loop in there, which is used for an intro, but we think of ourselves as musicians and, even though we're not into the Jazz genre much or play that style, we have a similar approach and like to dig into the vibe. We like to forget about time and be in the music, although obviously we play the songs in a way that people can recognise them." ""We both play synths and samples and sample all of our sounds. When we play live we play 100% live." Are Little Dragon appreciated in your homeland Sweden? Are they drawn to electronic music in the same way as other European cultures? Fredrik: "It's getting there, but it's been slower in Sweden. The media there have always been more focused on pop music. That's a question I want to ask when we have our next Swedish interview; not why are we not so appreciated, but compared to other territories it's surprising. I guess we don't sound that Swedish, but on the radio Avicii is huge, and Swedish House Mafia and other electronic pop stuff like Robin; but also, more conceptual bands like The Knife are really celebrated." Nabuma Rubberband is out now via Because Music. Head to little-dragon.net for the latest news and tour dates.